Carols for Advent and Christmas. Everyone welcome, family-friendly free event. 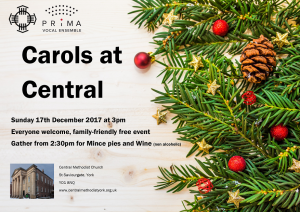 Gather from 2:30pm with mince pies and non-alcoholic mulled wine. To help us cater sufficiently, please indicate you’re coming on our Facebook event page! All enquiries to Deacon Judth Stoddart. and you who have failed. Come. 3rd December – 10:30am Christmas Gift Service (Kyra are coming to speak about their work). 5:15pm Advent procession at York Minster. (Doors open an hour before – arrive early for a good seat!) No service at Central. 17th December – 3rd Sunday of Advent, 10:30am morning service(S Leah & Deacon J Stoddart), 3pm Community Carol Service. 31st December – New Year’s Eve – 10.30am morning service only (P Wheeler). On Sunday 5th November Revd Steve Wild (District Chair for Cornwall, ex-President of the Methodist Conference) will be preaching at Central Methodist in York. Central would like to invite others to join us for worship at both 10.30am and 4pm. 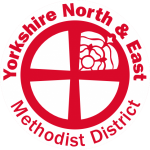 We generally celebrate our ‘anniversary’ on the first Sunday in November, celebrating the years since the union of the Centenary and Wesley congregations and further to the earlier history of Methodism in York. As the afternoon service is at 4pm it should be finished in good time to allow you to use public transport to get to Central. 8th October is the day of the Yorkshire Marathon. Knowing that transport is tricky for many when roads are closed, we’re doing something different. Our church will be open soon after 9am, with Tea, Coffee and biscuits in the vestibule. At 10:30am in the vestibule there will be a short said service. This will probably only be 15 minute long. The door will be open and hopefully coffee and conversation flowing until about 12:30pm. All are most welcome, if you are able to make it at some point during the morning then please drop in, and bring your friends! On September 3rd 2017, Deacon Judith Stoddart (along with other new circuit staff) was welcomed to the York circuit at Acomb Methodist church. The annual welcome service marks the start of the Methodist year. 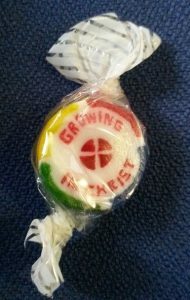 surprising, compelling call into Diaconal Ministry. We also welcome Rory as our new Presbyter Minster. Originally hailing from South Africa, Rory has worked for the last 11 years as Chaplain to the University of York. He’ll also have pastoral charge of Haxby and Wiggington Methodist Church. In the picture above, Rory and Judith are holding a huge paper bag containing pieces of rock, with ‘Growing in Christ’ running through. We look forward to growing in Christ alongside them. Our church will be open from 11am until 4pm on Saturday 9th September. This is officially part of the Heritage Open Days. The inside of our chapel is usually a wonderful surprise for residents who visit during the day. You’ll be very welcome to pop in and have a look around the chapel; some of us will be around to answer any questions you may have. You may even have an opportunity to hear what is generally regarded as one of the best organs in the city. There will also be time and space to sit quietly and pray. There’s no need to book in advance. 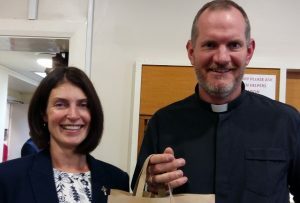 After ten years of faithful service in the York circuit, this summer Revd Chris Humble will be leaving Central for County Durham. Chris’s final service as minister at Central will be held on Sunday 9th July at 6:30pm, at which we’ll be joined by many of Chris’s ecumenical colleagues. Refreshments will be served after the service, and we’d be very pleased if as many people as possible were able to share in this event as we give thanks for Chris’s ministry. From September (the start of the Methodist year), our minister will be Revd Rory Dalgleish (previously chaplain to the University of York). We’ll also be welcoming Judith Stoddart, who takes up a new role as city centre deacon based at Central. The changes are exciting for Central, our city, and circuit. We will continue to keep Chris, Rory, Judith and their families in our prayers as they make their transitions. Easter is about more than egg hunts, bunnies and extra days off work. Come and worship the risen Lord with us at Central. Services at 10:30am and 6:30pm. Holy week and Easter are a very special time to Christians, so there are a number of special services and events occurring which everyone is welcome to join. Palm Sunday (9th April): Services at Central at 10:30am (Family all-age worship led by Circuit children & families worker) and 6:30pm (Holy Communion led by our minster). Maundy Thursday: Services around the circuit at various times. eg 2pm New Earswick Chapel or 7.30pm Stillingfleet Chapel. Good Friday: Services around the circuit at various times, plus Walk of witness with the cross from Parliament St, followed by Ecumenical service at York Minster. (6.45pm & 7:30pm). 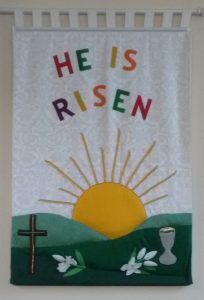 Easter Sunday: 9am: Easter breakfast at Central, 10:30am: Worship at Central, including Holy Communion, led by Rev Dr Michael Chester, 6:30pm: Worship led by Vic Paylor.